Editable PSD files included for easy customization of logo, News & Events box, and custom, graphic buttons. 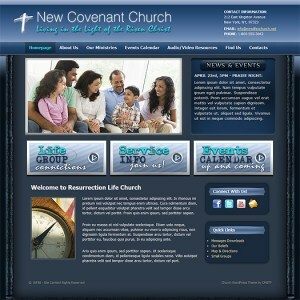 A deep royal blue is front and center with this new premium WP church theme from CMS Themefactory. With this new church website theme we've aimed to create a strikingly impactful design scheme along with a layout that's inuitive for both the website manager and the end-user, your church members and visitors. This premium church WordPress theme comes complete with all of the photos you see in our live demo - and features functionality such as a built-in drop-menu, an editable slideshow, editable, custom graphic buttons, and much more. Make your mark online, by launching your community's website with this powerful, flexible, visually appealing WordPres church website theme.